Prof. S. Uda's lab. 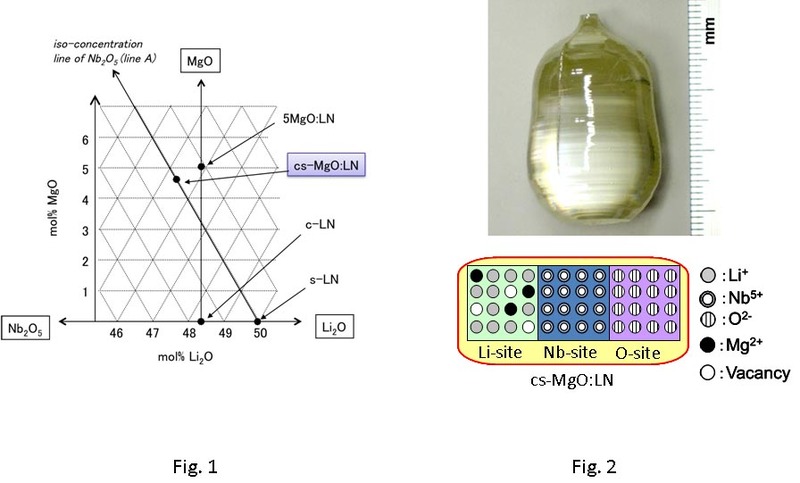 (Crystal Chemistry group) and Prof. Taniuchi of Center for Interdisciplinary Research have successfully developed a new single crystal of LiNbO3 (lithium niobate: LN) addressed as cs-MgO:LN. This was invented by the intentional introduction of an impurity (MgO) and defect (vacancy) to LN crystal that makes a LN crystal congruent with stoichiometric structure. cs-MgO:LN is very easy to grow and shows superior optical properties over the conventional LNs, particularly in their homogeneities. cs-MgO:LN is used as a frequency conversion device in low dimensions and is a potential candidate for pure green color source for a large display, medical instruments and measurement hardware for physical properties. The research result was presented at the 57th Spring Meeting of the Japan Society of Applied Physics, and published in newspaper (Kagaku Kogyo Nippou, on March 11, 2010).